The tags for cows are changing. 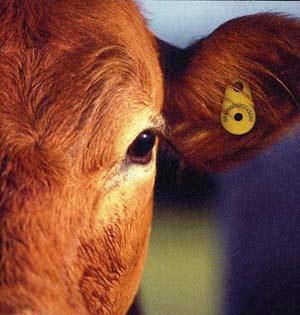 No more will our Canadian bovine friends accessorize with a triangular green ear ornament detailing their identification number, but instead will model a yellow round disc. However, cows already adorned with last year's fashion piece must not have it removed --since that is illegal-- but rather must have the latest earring added to their attire. These cows are clearly going to be punk cows. ... waiting for them to approve the export papers for my cat. May I just say that going to this particular organization for my little furry non-consumable pet kitty was highly disturbing? I distracted myself by reading a leaflet on compensation for Government destroyed animals. Wonderful. "Application for import: dogs, cat, foxes, raccoons and skunks." Now, it might be just me, but it seems a little surprising that the import of foxes, raccoons and skunks is sufficiently common to warrant inclusion on a standard form. I made a mental note to keep this sheet handy when I was on the plane. If my neighbor objected to being seated beside a cat, I could point out that should he complain and move, he might be located by a skunk. At length, I was called through to the main office to meet with the Government vet. He stamped my paperwork and told me that he had wanted to be an astronomer when he was small. I told him I had wanted to be a vet for years of my childhood. We both eyed each other, trying to access who had made the right choice. Then the stamping was done, the papers returned to me with three additional copies. I tied an elastic band around my folder and stuffed it in my backpack. One shiny bright kitty, ready for consumption. I mean, export. Thank you, Jan! When I went back to Canada, I found an apartment that would take both of us so she'd remember who I was before she got stuffed in a carrier for a 13+ hour flight.